This one is strictly for myself. My mother-in-law passed away suddenly three days ago, on the 19th of July. A lovely lady who will be sadly missed by many, many people, she had a great love of gardening and enjoyed the out of doors. I took this photo out of our flat window earlier this month. I didn't get the chance to share it with her, we lived 150 miles apart. I know she would have liked it. affecting dedication and the beautiful rainbow. A beautiful tribute to someone you hold dear. Wonderful rainbow and a beautiful lush scene. A marvelous composition. This is one of the most beautiful rainbow photos I have seen. The exposure is outstanding and it is amazing that we can see the rainbow effect so close to the ground. Excellent composition. 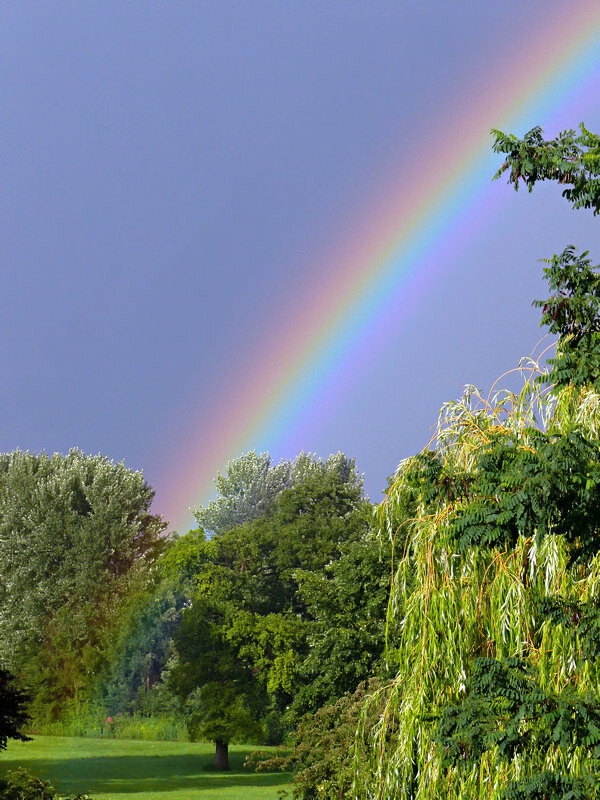 You've caught this rainbow just at the right moment and it's chosen this beautiful English garden as a landing place! Brilliant work and a very nice tribute to your late mother-in-law. Excellent Photo! I love the colors and how the rainbow splits the sky like that! Did you use any Grad filters for the sky or was that all just from the way the rainbow ended up? I have missed this amazing (and now my favorite) picture. Great is all. The lights, superb vivid colours, razor sharpness and excellent details of whole image, great composition and, of course, terrific subject. My congratulations.